Israel has strongly denied a report that it spied on US-led talks on Iran's nuclear programme in order to build a case against a deal. A senior Israeli official told the BBC that the claims, reported in the Wall Street Journal, were "utterly false". The Journal said the White House had been particularly angered that Israel allegedly sought to share confidential details with US lawmakers and others. Many Republicans in Congress are opposed to a deal with Iran. Earlier this month, Israeli Prime Minister Benjamin Netanyahu told the US Congress that a deal being discussed could "pave Iran's path to the bomb". The US, UK, France, Germany, Russia and China are seeking an agreement to curtail Iran's nuclear programme in exchange for sanctions relief. They fear Iran wants to build a nuclear bomb - something Iran denies. Israel is not a party to the negotiations although it feels particularly threatened by the possibility of a nuclear-armed Iran. Israel's deep concerns about any emerging deal on Iran's nuclear programme are well known, as are the tensions this is placing on ties with the US administration. After Benjamin Netanyahu attacked President Obama's Iran policy in an address to the US Congress this month, the White House organised a series of snubs. It extended no invitation to the Israeli prime minister to meet Mr Obama in Washington and suggested the Israeli government was not trustworthy. There was also a leak about new limitations on intelligence sharing. Despite the strong denials from Mr Netanyahu's office this article will only add to strains with Israel's key ally. Outgoing Foreign Minister Avigdor Lieberman has also dismissed the report as "incorrect and inaccurate". He told Army Radio: "Clearly, Israel has various security interests, and clearly we have our own intelligence. But we do not spy on the United States. There are enough participants involved in these negotiations, including Iranians, first and foremost." The sides aim to reach a framework deal by the end of March. According to the Journal, Israel began eavesdropping on the talks last year and also acquired information from confidential briefings with US officials and diplomatic contacts in Europe. The White House uncovered the operation, the report said, when US intelligence agencies spying on Israel intercepted messages among officials that could only have come from closed-door talks. But it was Israel's sharing of inside information with US lawmakers and others that particularly angered the White House, the report quoted an official as saying. "It is one thing for the US and Israel to spy on each other. It is another thing for Israel to steal US secrets and play them back to US legislators to undermine US diplomacy," the unnamed official said. A White House official told the BBC there was nothing to say on the matter at this time. Speaking to the BBC, a senior official in Mr Netanyahu's office said: "These allegations are utterly false. "The state of Israel does not conduct espionage against the United States or Israel's other allies. The false allegations are clearly intended to undermine the strong ties between the United States and Israel and the security and intelligence relationship we share." 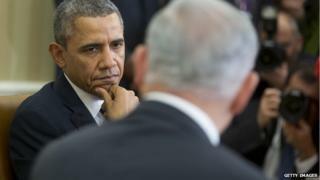 The report comes amid tense relations between the White House and Israel. Mr Netanyahu angered Washington in his recent re-election campaign when he said he would not allow a Palestinian state if he was returned to office. He later tempered his statement, saying he did want a two-state solution, but that "circumstances have to change".